Collaborated with Bynd Artisan to deliver these designs for Bank of Singapore. Client wanted something vibrant and different. Special thanks to Kenny and James for their patience and trust in me with this project. The deadline was tight. 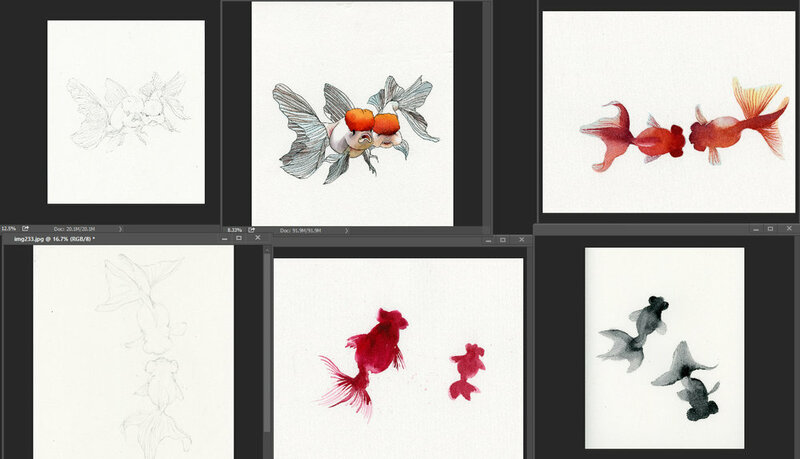 Preliminary sketches and test render of goldfishes. Lots of details to considered. These included the numbers of fishes/fins involved (auspicious numbers) to the spread and directions of the fins/tails. At this stage, the design is still undergoing changes. Completed by Kenny of Bynd Artisan. The final design features various accent of gold emboss and an elegant die-cut that accommodated for the hongbao's folds along the goldfish illustration. Final product. Photo courtesy of James. Design featured in the local chinese Paper.